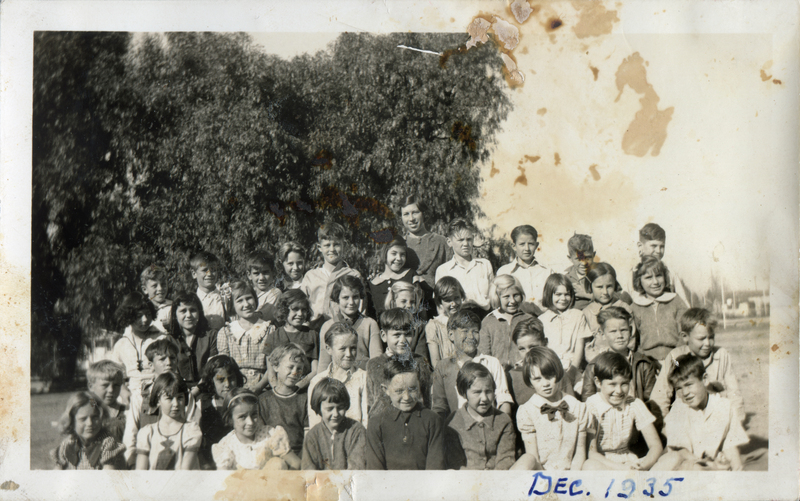 Photo contributor Patricia Bennett (nee Patricia Pearl Cook) has identified this as Miss Frisbee's class, December 1935, and writes on the back: "42 children! How did she do it?" We count just 40, so maybe that was the secret — not all of them showed up for school every day. These children attended the fourth iteration of the K-8 Newhall School, built in 1928 at what is now 24607 Walnut Street. (The first burned down, the second met an uncertain fate and the third was outgrown). The fourth school burned down in February 1939 — just prior to Patricia Cook's June 1939 graduation from the eighth grade — and was rebuilt in place. PC3502: 19200 dpi jpeg from original photograph donated 2003 by Patricia Bennett (nee Patricia Pearl Cook) of Carpinteria.